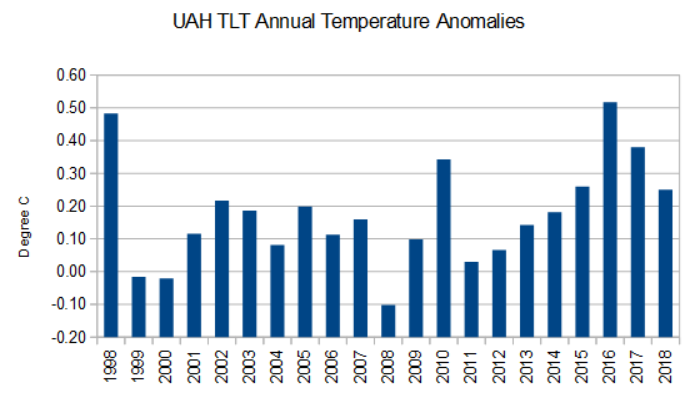 The Version 6.0 global average lower tropospheric temperature (LT) anomaly for December, 2018 was +0.25 deg. C, down a little from +0.28 deg. C in November. The 2018 globally averaged temperature anomaly, adjusted for the number of days in each month, is +0.23 deg. C, making 2018 the 6th warmest year in the now-40 year satellite record of global lower tropospheric temperature variations. The linear temperature trend of the global average lower tropospheric temperature anomalies from January 1979 through December 2018 remains at +0.13 C/decade. As Roy points out, this makes 2018 the 6th warmest year since 1979. Effectively, however, it means it is also the 6th warmest since 1998, and confirms that global temperatures have more or less plateaued since 1998. It puts 2018 behind 1998, 2010, 2015, 2016 and 2017.